We're taking a momentary sidestep from Meryl's filmography to take a look at her work in FOX animated television series. Surprised? Yeah, Streep isn't too cool to engage in some semi-lowbrow antics with America's favorite dysfunctional family or even a band of redneck, slow-talking Texans. 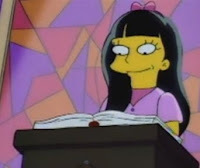 First, chronologically speaking, is her stint as hell-raising pastor's daughter Jessica Lovejoy on The Simpsons. Perhaps the truly amazing quality of this episode of the wonderful series is that you really have to listen closely to notice that Streep is voicing the youngster who has entranced Bart into puppy love. As I always say, it's her "ch" sound that gives her away. Jessica is great fun and a perfect math for Bart, as she shows the bad-boy where his limits lies. I mean, you know what they say about pastor's kids... Though the episode ends with the two-faced kiddo being sent off to boarding school, Bart's first love will always and forever be Meryl Streep. 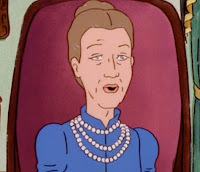 And then in 1999, Streep was somehow talked into appearing on the latest critical and ratings darling from the FOX animated lineup, King of the Hill. Now, though I'd never actually seen an entire episode of the show until now, I've never really understood its appeal. For a Southern comedy with such praise heaped onto it, particularly in its early years, its surprisingly mundane and definitely hard to make through 20-odd minutes of. 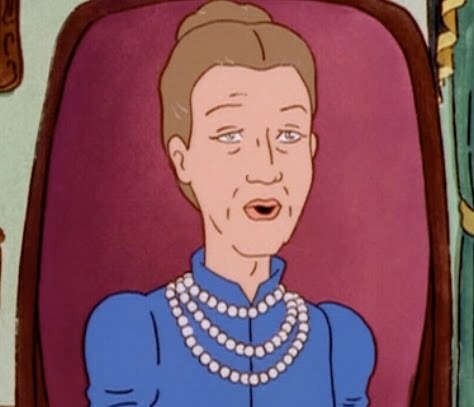 Streep's character is the Cajun aunt of one of Hank Hill's friends. The gang ventures to Louisiana when Hanks whens a contest from, what else, a beer company. Though its delightful to hear Streep rattle off some deep South French, she's primarily pushed to the side. Her character gets even less screen-time than her three live-in widowed daughter and daughters-in-law (voiced by the Dixie Chicks, no less). So though she definitely brought some much-needed excitement to this intensely dull show, it truly wasn't enough to engage this viewer. But still. Meryl Streep doing cartoons is the greatest thing ever. I never got King of the Hill either. I like everything else Mike Judge, but not that. I loved Meryl on The Simpsons! you're right, she was so well disguised. Good episode, too. I had no idea she was on KOTL though...i shall have to check that out. Haha! Never saw this, which I find slightly weird.